How can I paste my form into my WordPress Site? I pasted the form code directly into the WordPress editor, but I am not able to view the form. Help? Hello. Thank you for posting your issue here on JotForm. We will do our best to help you out on this. We have an easier embed method for Wordpress and it requires you to install a Wordpress plugin. 3. Type and search "JotForm Embed". When you see the "Embed Form" plugin click "Install Now"
5. 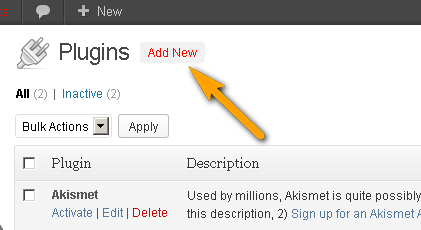 After you have activated this plugin, go to your post editor or page editor to start embedding forms. You should see the "JotForm" icon from the toolbar. Please make sure you are on "View" mode. 6. Once you are logged in and have clicked the icon, the form selector window should popup. You can choose your forms here to embed. Any chosen form will be attached as a Wordpress shortcode on your post or page. My wordpress does not offer the option to "add plugins"
Make sure you have Administrative Privilege to access your Plugins. Are you the Admin of your wordpress account? If not only admin can request and add permission to you so you can have access to Plugins. Check you settings under "Users" then check your "Role".